Luzi Stamm entered the Swiss Parliament in 1991 and he has been re-elected ever since. He is a vice President of the Swiss People's Party (SVP). Stamm works as a lawyer. He is also has a Master's degree in economics. He is a member of the Swiss Parliament's foreign policy commission and the commission for legal issues. Stamm was also president of the regional court in Baden (AG) and a member of the European Council in Strasbourg. As a hobby, he played for many years the piano in a local Rock'n Roll Band called "Roaring Sixties". Martin Naef is a member of the Social Democratic Party. In 2011 he was elected to the Swiss Parliament, where he is a member of the foreign policy commission. He is also co-president of the Parliamentary group Switzerland-EU. Naef studied law at university and has worked as a youth advocate. He was also member of the Zürich Cantonal Parliament. Today, Naef is the staff manager of the Guardianship office of the city of Zurich. He is a fan of the Zurich football Club (FCZ) and he is big advocate of culture. Charlotte Sieber-Gasser was a co-founder and chairwoman of the Swiss pro-European youth organisation 'young european Swiss - yes' and a leader for the youth campaigns for the EU-Swiss Agreement on the free movement of persons and the Swiss cohesion payment to the new EU member states. She is currently head of the european policy commission of Operation Libero, the new liberal movement of Switzerland, for whom she advises on its campaigning on Swiss foreign policy. Sieber-Gasser studied law in Switzerland and Development Studies in the UK and holds a PhD in law. She is currently a Post-Doc fellow and lecturer at the university of Bern on European law, international public law and international trade regulation, and a visiting research fellow at the Graduate Institute in Geneva. Bruno Waterfield is a political journalist with more than fifteen years' experience, twelve of which he has spent in Brussels. Since 2006 he has been Bursting the Brussels bubble for the Daily Telegraph (2006 - 2015) and most recently he became the EU correspondent for The Times. Bruno Waterfield was also a founding member of www.ePolitix.com's editorial team. He was editor for a daily online EU news service, EUpolitix.com, and ran the fortnightly Parliament Magazine. In addition, he is a former Westminster-based lobby journalist and commentator. Bruno describes himself as a Clash city rocker. David has a core organisational role in producing the Battle of Ideas weekend at London's Barbican Centre and also convenes the festival’s two-month long series of national satellite events. Outside of the festival he produces, chairs and speaks at events for schools, universities, festivals and business on a broad range of topics. He also contributes to national broadcast and print media on issues relating to politics, the regulation of lifestyle, the arts and popular culture. He has a MA in Creative Writing from the University of Exeter. "We have to give ourselves a constitution which marks the birth of Europe as a political entity." "From now on, monetary policy, usually an essential part of national sovereignty, will be decided by a truly European institution." Is the EU a threat to democracy or its guardian? François Hollande has declared the EU ‘remote and incomprehensible’, and David Cameron has accused it of being ‘too big, too bossy, too interfering’. Even the former European Commission president José Manuel Barroso has called for a ‘truly democratic debate’ on the future of Europe. The real power in the EU rests with the member states in the Council and with the bureaucrats in the European Commission, rather than in the elected European Parliament. And the EU has what amounts to a veto over the expressed will of non-member states such as Switzerland. While EU politicians openly worry about the so-called ‘Eurosceptic earthquake’, which manifests itself in low voter turn-out, public apathy and public disengagement. They are also contemptuous of popular and militant anti-EU parties; the supporters of which they denounce as racist, backward and ignorant. But if the EU is really so dismissive of and remote from the masses, why, seemingly, do most citizens still want to remain members? Why is there, undoubtedly, a waiting list of nations to join? For instance, the people of Ukraine are apparently willing to die to become a member of the EU and have their representatives sitting in the European Parliament. Do the Commission, Parliament and Council of the European Union really have the right to decide policy and the law on behalf of member and non-member states; even when the majority of people of a particular nation state are clearly opposed? 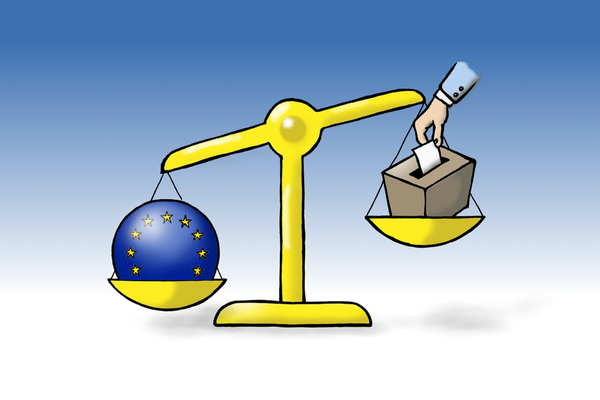 Or is the EU a legitimate institution that combines the best elements of our common values and democratic ethos? In other words, does the EU ensure that we never again slip into xenophobia and backward forms of rule, so that we maintain an epoch in which European nations are prosperous, interdependent and free? Or does it threaten national sovereignty? Paris is less amenable than Berlin to accommodating London’s demands. Paris will now have to craft an operational policy, sooner rather than later given that there is an EU Council meeting next month. This will entail the crafting of a joint French-German approach. The probability that the British referendum on EU membership will happen in proximity to France’s and Germany’s general elections will weigh on both countries’ negotiating postures. Chancellor Angela Merkel and President François Hollande will not want to be seen as giving in too readily to a country whose legitimacy as a full EU player is widely questioned on both sides of the Rhine. Analyse: Historikerstreit, prominente Kandidaten, übermässige Medienpräsenz: Die SVP dominiert den Wahlkampf nach Belieben. Dabei sind die Wahlen nur der Anfang – die entscheidende Schlacht findet erst danach statt. Die drohende Abstimmung über die Zukunft der Schweiz in Europa bietet die Bühne für das einzige Thema, das der SVP wirklich wichtig ist: die eigene Souveränität. Wir haben einen Vertrag mit Revisionsklauseln und Kündigungsfristen abgeschlossen. Den halten wir ein. Doch weil die Personenfreizügigkeit in eine Katastrophe mündet, hat das Schweizer Volk beschlossen, davon wegzukommen. Im Vertrag wurde vereinbart, dass das Abkommen zu revidieren sei, wenn es wirtschaftliche und soziale Schwierigkeiten gibt. If the United Kingdom ever decided to leave the European Union, people would wake up and realise they had made a very grave error indeed. A year ago I [Branson] wrote about the need for the UK to stay in the EU, and why it is so valuable to British businesses. Nothing has changed, but the argument rumbles on. Last week [January], the Swiss government proposed a “safeguard clause” to limit EU immigration. British Eurosceptics’ ears pricked up: the proposal sounds remarkably like Downing Street’s “emergency brake” proposal, which David Cameron eventually backed away from in his immigration speech in November. Many within Ukip and the Conservative party would like Britain to withdraw to a Swiss-style relationship with the EU, which they hope would allow them to pick and choose. Should the Swiss succeed, British Eurosceptics will ask: if they can limit immigration from central and eastern Europe, why shouldn’t we? Did I fall asleep and wake up in the fifteenth century? I ask because, according to news reports, the unelected lords of Britain’s second chamber are currently trying to prevent the British public from having a say on our relationship with unelected suits in Brussels. Enraged by Conservative prime minister David Cameron’s proposal that we should have an in/out referendum on Britain’s membership of the European Union in 2017, various lords have accused him of putting our nation’s fate in the hands of a ‘lottery’ in which much of the electorate, won over by ‘the daily war drums of the unyielding Europhobes’, will probably dumbly vote to leave the EU. Für Christian Levrat ist die Schweiz ein Land am Scheideweg. Im Interview spricht der SP-Präsident über Schweizer Geschichte, den Euro-Mindestkurs und die SVP als Giftmischerin.